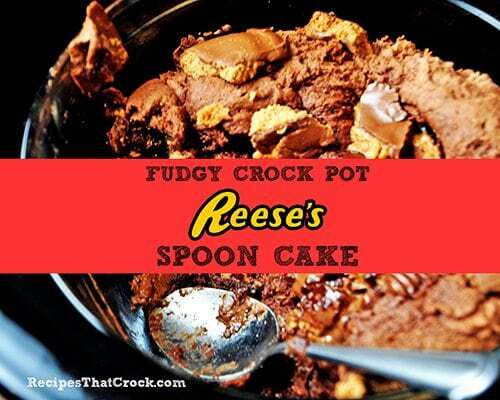 Reese's Spoon Cake - Recipes That Crock! 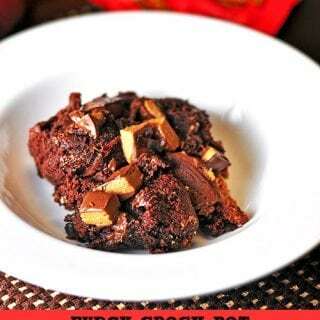 Are you looking for a yummy crock pot dessert? Are you a Reese’s Peanut Butter Cup fan? Look no further! 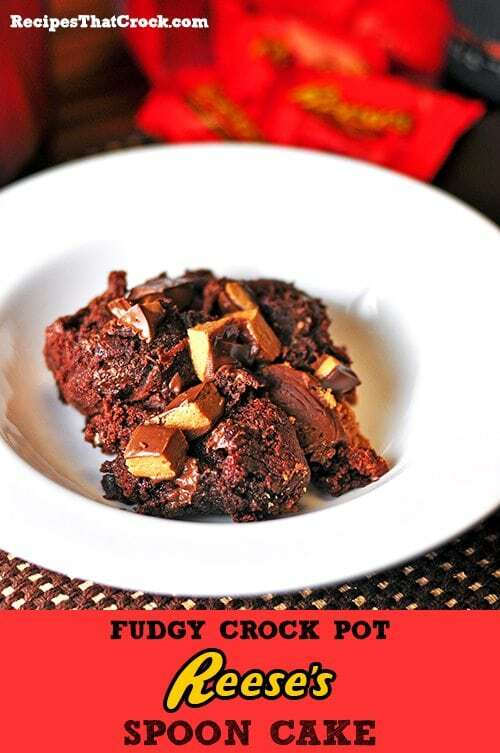 This Fudgy Crock Pot Reese’s Spoon Cake is a perfect way to cRock the pot in a sweet way! The idea for this recipe came to me when I was flipping through Gooseberry Patch’s Slow-Cooker Recipes Cookbook . I saw a recipe by Lisa Hays of Crocker, MO called Chocolate-Peanut Butter Cake. Now I don’t know about you, but when I hear the words chocolate and peanut butter together, I instantly think of Reese’s Cups! So naturally I decided to substitute crushed Reese’s Cups for the peanuts… what else is a girl to do? And Fudgy Crock Pot Reese’s Spoon Cake was born. You are welcome. It is rich and chocolatey and all things lovely. And it is super fudgy. Don’t worry about the calories, you will get a workout mixing this baby up. The ingredients are simple, but it is the mixing them together that will be a bit of a challenge. The cake itself is three simple ingredients: a chocolate cake mix, peanut butter and a bit of water. Then comes the sweet yummy topping… Crushed Reese’s Cups. That is really all there is to it. Cake Mix Size Too Small? Side Note: This recipe calls for an 18.5 oz Chocolate Cake Mix but all mine were 15.25 oz. So I keep an extra box of cake mix around to add the needed amount to recipes to make them a full 18.5 oz mix. I measured by weight, but when I scooped it into my measuring cup it measured about 2/3 cup of mix I needed to add to make the recipe correctly. Does Your Recipe Call for a Coffee Can? The original recipe calls for cooking the cake in a coffee can, but I prefer to bake using the largest bowl from this set found on Amazon in lieu of a coffee can for breads and cakes. All you do is spray it well with cooking spray or grease and flour it and add your mixture to it. You then place it in your crock pot and cover with 4-5 paper towels so the lid condensation does not drip on your cake. (Check out more baking and dessert tips over on this post.) Bake in slow cooker for 3-4 hours on high until baked through. Super fudgy Reese's Spoon Cake made in the crock pot! Place in a greased oven-safe bowl and place inside your slow cooker. Top mixture with half of the Reese's Cups. Cover top of slow cooker with 5-6 paper towels to catch lid condensation. Bake in crock pot for 3-4 hours on high until set. *Note: This is not a fix it and forget it recipe. You will need to check the cake periodically to make sure it is not over cooking. Top servings with remaining Reese's cups. This cake is super rich. 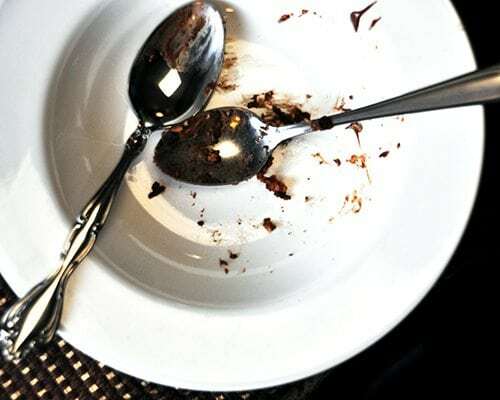 So grab some ice cream and a couple spoons and share with a friend… a really good friend that you like 😉 Affiliate links were used in this post. what do you do with the rest of the cake mix that is left after using only 2/3 cups of it? Paula- I keep it in a sealed bag to use with other recipes that call for the larger size and use as needed. I sacrifice one box to help make the other boxes “full size”.